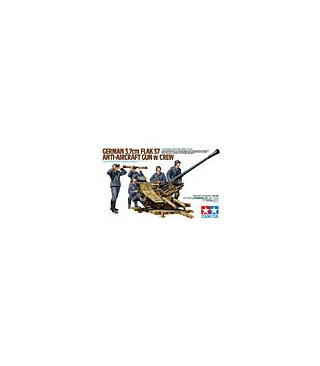 First released in 1989, Tamiya's mechanically detailed 1/35 3.7cm Flak 37 became a very popular item and often appeared in dioramas as a supporting piece. Fans have long awaited the release of this kit with anti-aircraft crew figures, and a collaboration with ICM has made this possible. A diorama depicting the crew shooting at a low flying approaching fighter aircraft can now be accurately portrayed with this set. The set features excellently proportioned figures with sharp details. Set includes 5 crewmen figures: A commander looking into binoculars, a gunner,a spotter with rangefinder, and two loaders.